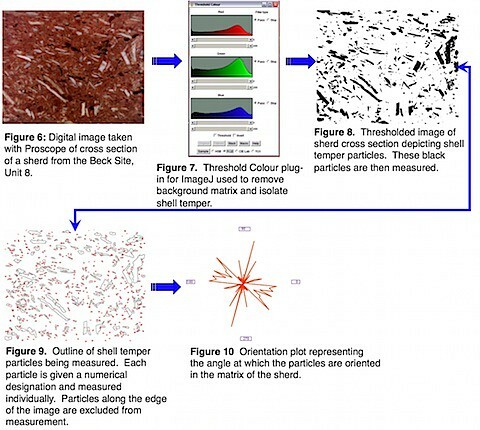 One area of technical interest of mine is exploiting image analysis software as a means of standardizing and automating the characterization of archaeological materials. Over the years, a variety of applications has been developed that enable users to take photos of sherd sections or collections of micro artifacts and extract metrics and morphological information from them. These systems allow researchers to characterize thousands of objects at a time - virtually impossible using manual approaches. An example of how this might impact archaeological research can be seen in the work of Stoltman et al(2005: Petrographic evidence shows that pottery exchange between the Olmec and their neighbors was two-way. Proc Natl Acad Sci USA Petrographic evidence shows that pottery exchange between the Olmec and their neighbors was two-way. Proc Natl Acad Sci USA) where the entire conclusion is based petrographic (shape, minerals) consisting of a sample of ca. *20* sherds. In addition to the assertive nature of their empiricist claims, the entire endeavor is weakened because it takes so long to do what Stoltman does by hand. What would happen if he had a sample of 1000 sherds? Of course, given the strongly essentialist nature of the analysis (i.e., there is *an* answer to the question so regardless of the theoretical meaning of the measurements and size of sample studied The Answer will be produced), they would argue that they falsified other claims (largely framed the same way, so the argument is mostly counter pounding). Of course its all nonsense and an issue that will never be settled by arguments by authority (for which the Stoltman/Marcus/Flannery folks are famous). But back to image analysis — if we had ways of doing analyses like these in an automated way we could potentially generate studies that characterize the variability of materials across statistically relevant sample sizes. Image analysis software, fortunately, makes this possible. I have been some of this work with a CSULB student, Jimmy Daniels as a way of characterizing temper morphology in Mississippian sherds. The procedure we follow is shown below (and the results of which will be presented at the the 2008 Society for American Archaeology meetings in Vancouver, B.C. The old standard of image analysis is NIH Image— a free package developed for the Mac back in the early 90s. This has been replaced by ImageJ a platform independent java platform with loads of add-ons and modules that expand the analytic capabilities. Scion Image is a version of NIH Image for that works for Windows and Mac. It has less support from developers, I think. I just came across this application Lispix - an image analysis program for the Windows and Macintosh platforms. It is written in Lisp (as one can tell by the name) and seems to have a lot of particle morphology aspects). JMicroVision is another choice that works on multiple platforms. It seems to have a good set of tools and statistics for characterizing particles. I haven’t tried these: OsiriX - Is an image processing software dedicated to DICOM images. ImageTool - Is a free image processing and analysis program for Windows 95/NT from the University of Texas Health Science Center at San Antonio. OSIRIS: a free medical image display and analysis package from the University Hospital of Geneva that is available for Macintosh, UNIX and Windows. Scion Image - A version of NIH Image for Windows and Mac.